97 degrees and humid, driving down to our mapping location for the day in Riohacha, Colombia with Samuel a Cruz Roja Colombiana (CRC) employee and 7 volunteers in our truck. All a sudden we make jolting halt and the staff and volunteers leapt into action with a backboard and first aid kit to respond to a motorbike collision across the road. While some volunteers dealt with traffic, others were first responders and helped get the injured person into the truck and transported to the hospital. Twenty minutes later, they returned to pick us up and we all went on to join the rest of the team to map out Riohacha. We were absolutely amazed at the responsiveness of the staff and volunteers and their dedication to upholding the ideals of the Red Cross Movement. Serving as first responders in these communities, the Cruz Roja Colombiana is truly in touch with the people they pledge to support. Every year in the Americas more and more people are living in conditions of vulnerability to natural hazards and climate change. 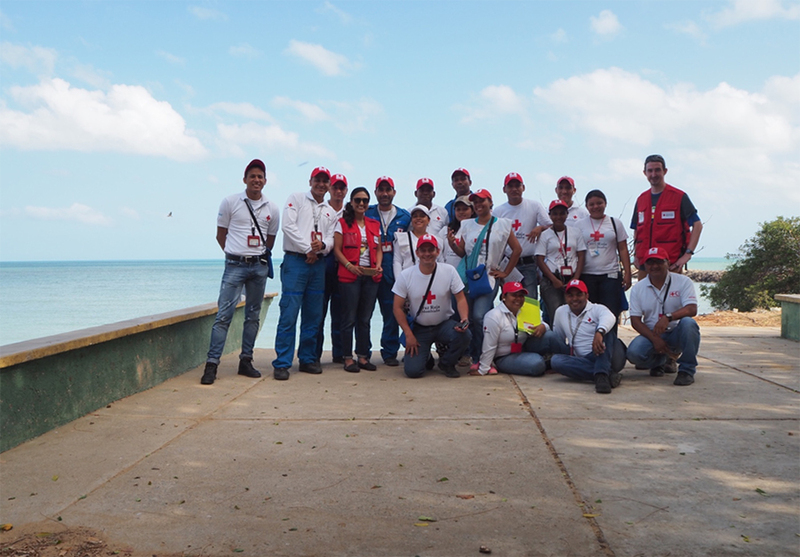 To help reduce disaster risk and enhance community resilience in the region, the American Red Cross is working with Red Cross partners to address local hazards and vulnerabilities in dozens of disaster-prone communities. 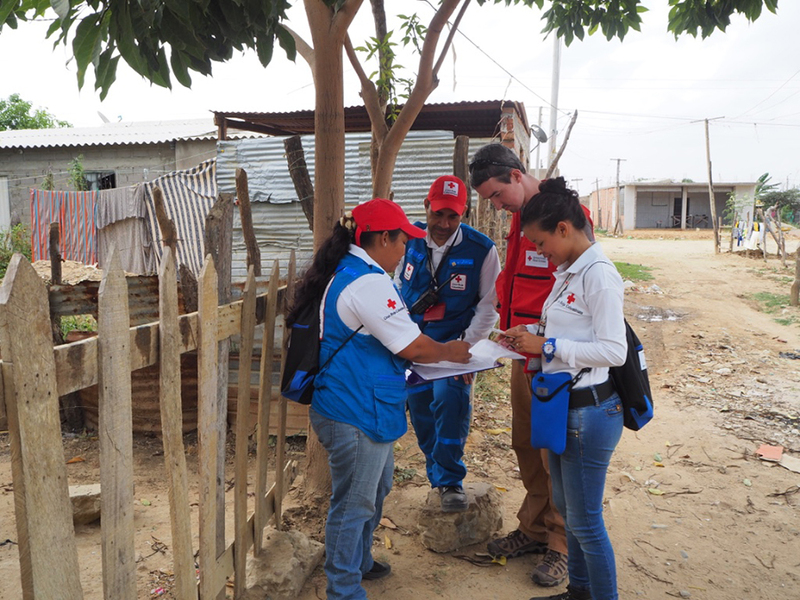 Through research and community discussion in the chosen communities the Colombian Red Cross has identified the top priorities for building resilience: Community health, water and sanitation, risk reduction, organizational strengthening, rights and advocacy, mitigation microproject and risk reduction. Nuevo Milenio – one of the mapping locations in Riohacha. CC-BY American Red Cross. 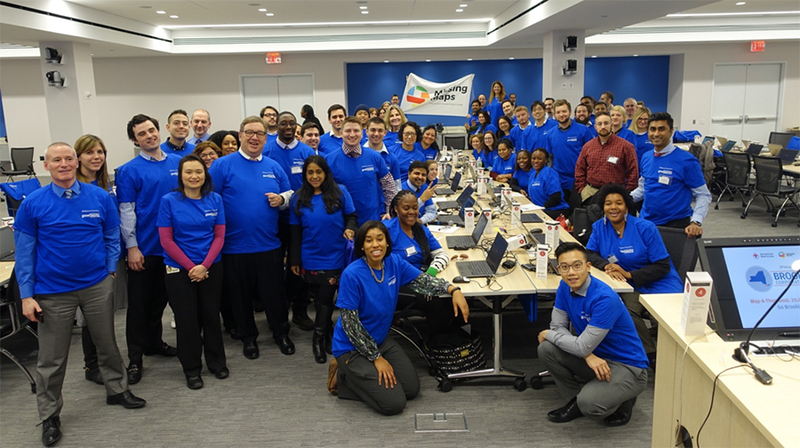 The American Red Cross team held mapathons in New York with JP Morgan Chase employees, and volunteers from Washington, DC and Bogota, Colombia using satellite imagery to remotely trace the area. With the recent imagery from Mapgive so we could have a more accurate understanding of what we were going to see in the ground. JP Morgan Chase employees at a mapathon in New York City remotely tracing for Colombia. CC-BY American Red Cross. 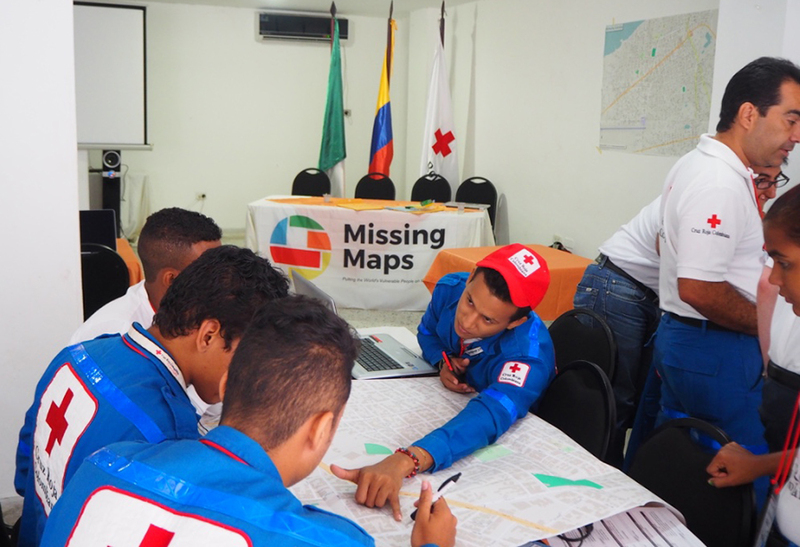 Four months before landing in Colombia we started conversations with Cruz Roja Colombiana to plan out the training and plan out the community mapping. We also extended invitations to local OSM groups, universities, other NGO’s and local government to collaborate and save a few seats to have a diverse group attend the training. Reaching out to the local OSM community is important as they have a good grasp about what might be useful to map in the area, as well as just a better understanding of the local area. As we do on all our trips we used the first day to visit each of the field sites taking pictures and understanding the areas better so we can finalize logistics for the next two weeks. We saw evacuation routes, garbage collection sites, community meeting areas, parks, and met with a few community leaders. Through our discussion with community members and staff We explained to them the goals of the mapping in the community and asked for input as to what they would like to see on a map of their community. The RITA program managers were excited to get the training underway and have as much time for field mapping as possible. We spent two days in a hotel conference room developing the OpenMapKit survey form and training the volunteers how to edit with OpensStreetMap and how to collect data using Field Papers and mobile phones. All of the volunteers and CRC staff were engaged and quick to pick up the topics we were discussing. The language barrier was one of our main challenges. The trainers did not speak Spanish and the trainees did not speak English. While Alvaro Barros, our translator was an irreplaceable asset, not being able to communicate in a manner that flowed did significantly slow the training process down. Luckily this young group of enthusiastic volunteers met us half way and we were able to work around the challenge and pick up new words as each day passed. Group discussions about community needs. Volunteer groups use large base maps of the area to start adding major points of interest and gain confidence in their map literacy. CC-BY American Red Cross. By the second training day the group had successfully mapped the area surrounding the hotel we were training in during their practice session. Early on the third morning we met at the Red Cross office and took a big school bus over to the areas. We grouped up, got our lunch bags for the day and set out to map two districts namely Nuevo Milenio and Villa Keiner. Due to the weather conditions, we wanted to make sure the volunteers had an early start, so they would not be working during the hottest part of the day. As we go around and check on each team, the CRC staff does the same with a Garmin Virb attached to the car that is driving through every street. The camera is set to take pictures every 3 seconds which we then upload to Mapillary. Checking a team's location in the field while mapping. CC-BY American Red Cross. Thanks to the amazing work being done by Cruz Roja Colombiana in these communities we were extremely well received. Several community members stopped the volunteers to thank them for all of the work that has helped them. It was rewarding to see and hear these interactions recounted to us. At the end of each day in the field, we upload and check data the volunteers collected on the phones so we can address any issues the next day. We upload pictures to mapillary, charge phones and extra battery packs and prep FieldPapers for our groups. 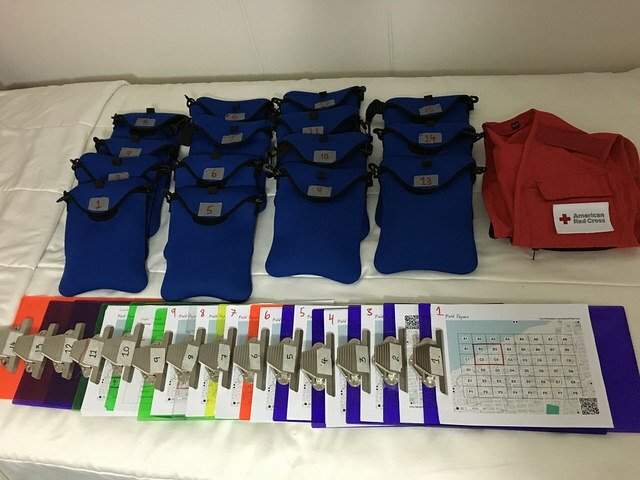 Preparation for data collection in the field. CC-BY American Red Cross. After all the data is collected in the field we regrouped at the hotel for two days to teach JOSM which included how to edit and upload the data collected through field papers. All areas are validating by two seprate groups and the trainers to ensure consistency with standards that are set by the OpenStreetMap community. One of out volunteers Jose Angel Diaz was excited to show us that he had spent his day off using the JOSM editor to map his hometown, outside of Riohacha! He even asked if we could help him obtain more recent imagery, so that he could finish mapping the area that was not clear in the available Bing Imagery. 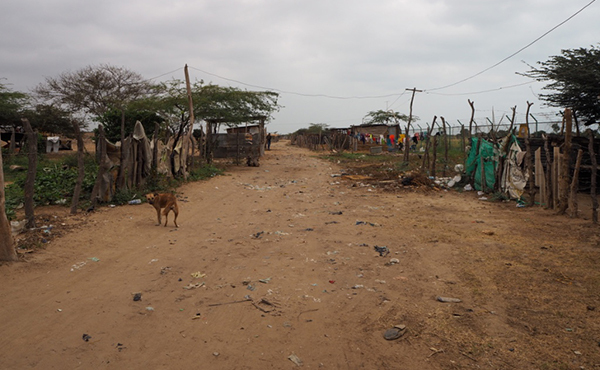 Overall, we enjoyed making new friends in the beautiful La Guajira region of Colombia. In ten days 27 volunteers surveyed 2 350 buildings of the 20 184 that were traced by remote volunteers. We’ve uploaded more pictures from our trip here. The group that mapped through the weekend. CC-BY American Red Cross. After we got back from Colombia we were able to analyze the data collected by the community. The validated base data was uploaded to OSM while the project-specific data was used to create maps to assist with planning and decision-making for various disaster risk reduction programs.